Top seed Talk n Text rout Ginebra 97-84, advance to PBA Commissioner’s Cup Semis - Balita Boss! The unbeaten Talk ‘n Text Tropang Texters are headed back to the PBA semifinal after 97-84 defeat of Barangay Ginebra San Miguel on Tuesday night at the SMART-Araneta Coliseum. Import Richard Howell, who missed the final elimination game due to shoulder injury, led Talk ‘N Text with 41 points and grabbed 22 rebounds. Former MVP Mark Caguiao led Ginebra with 19 points. Gabe Freeman, the third import of the Ginebra this conference, shot just 15 points on 2-of-17 shooting from the field. The two-time Best Import also grabbed 22 rebounds. 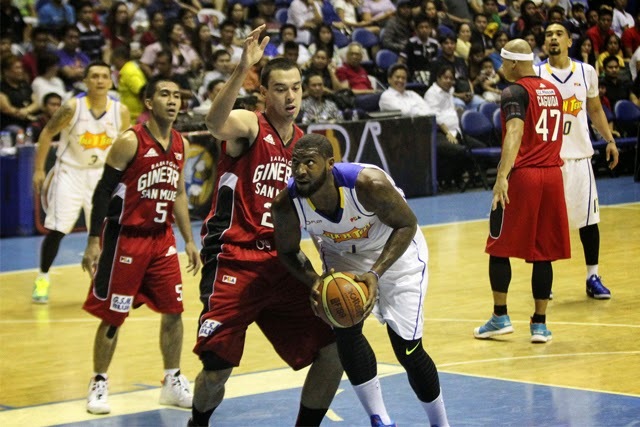 LA Tenorio contributed with 12 points. Howell, with 15 points in the first quarter, dominated the shaded lane against Ginebra’s defense. The Ginebra are still very much in the game just trailing 34-42 at the half. Howell continued to play well and had 14 points in the third quarter. The game was already decided when Ginebra struggled to make their plays and the Tropang Texters built a 20-point lead 7:29 remaining of third period. Ranidel De Ocampo also had a huge game for Talk ‘N Text with 15 points. Jason Castro and Larry Fonacier chipped in 13 and 12 markers respectively. The Tropang Texters await the winner of Rain or Shine and Meralco series for the best of five semifinal round.